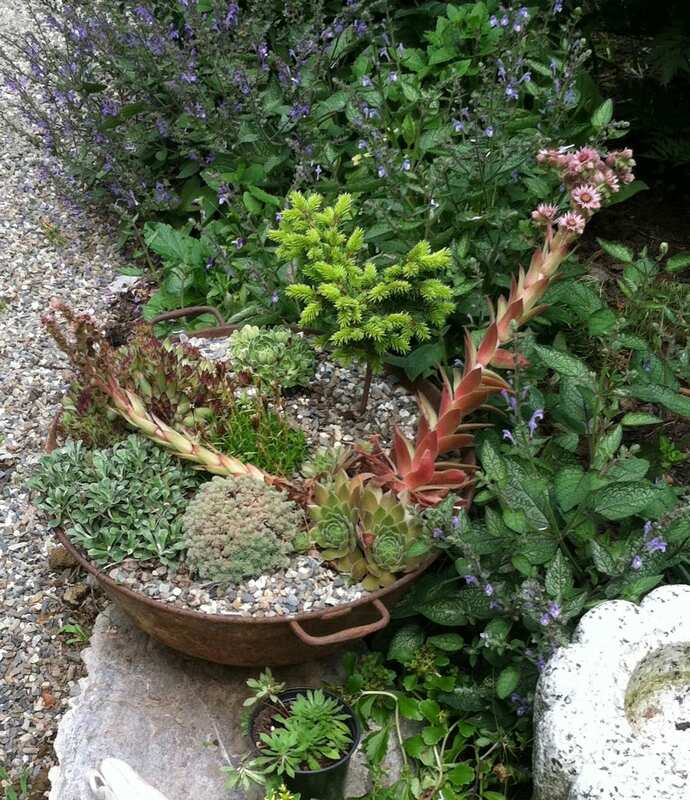 When people think of the plants for drought tolerant container gardens, immediately succulents come to mind. 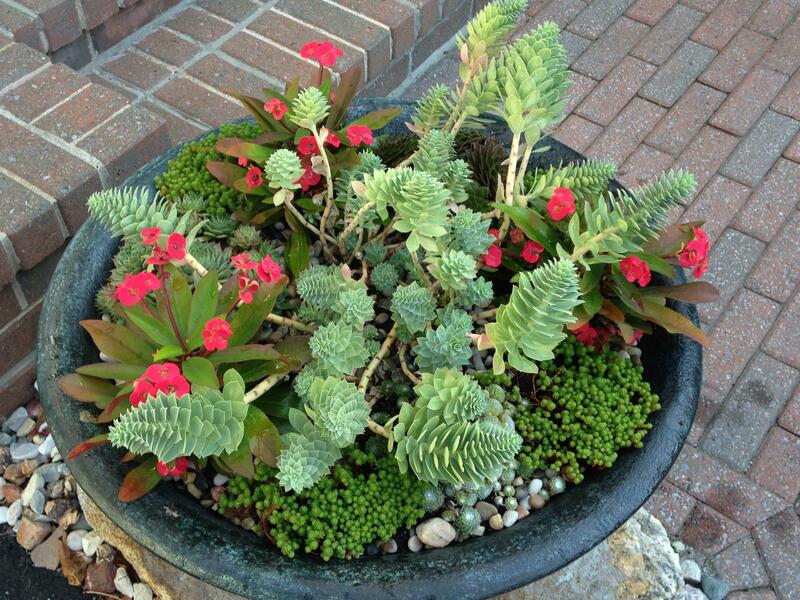 Succulents are great for that purpose, but there are many other plant options. Consider the opportunity of using native plants in place of the exotic succulents. Native, young woody and herbaceous perennials offer creative miniature landscape container garden options as seen here planted in hyper-tufa troughs. Just as you want to select the right plants that can tolerate dryer conditions or for settings with minimal-attention, it’s additionally important to have the appropriate soil medium and the right container. Those three main components – right plant, right soil, right container – help to ensure successful results. In this case, we are going to highlight a few plants that are New England to North American natives. A drought tolerant container garden should also include opportunities to attract pollinators, birds and beneficials while it offers visual appeal. 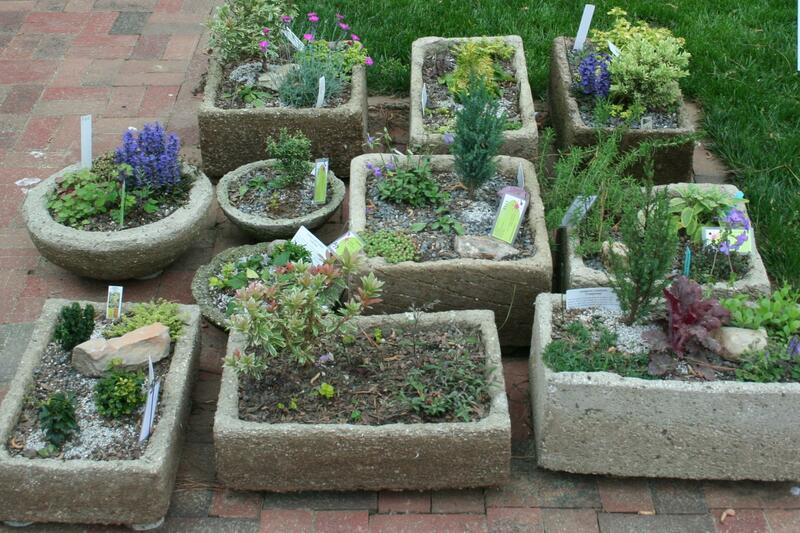 The traditional design criteria of a container garden can be applied to one that is also drought tolerant. Plants should still be proportionate to the planter and with the setting. The plants fulfill three design elements: focal, trailing, and textural, also known as, Thriller, Spiller, and Filler. Although non-native, these Euphorbia species blended with native Sedum acre offer a textural and vibrant drought tolerant display. These are helpful guiding principles; however, quite often it’s nice to keep your container designs minimal and simple. In turn this method can result in reduced demand for the care and watering of a container. 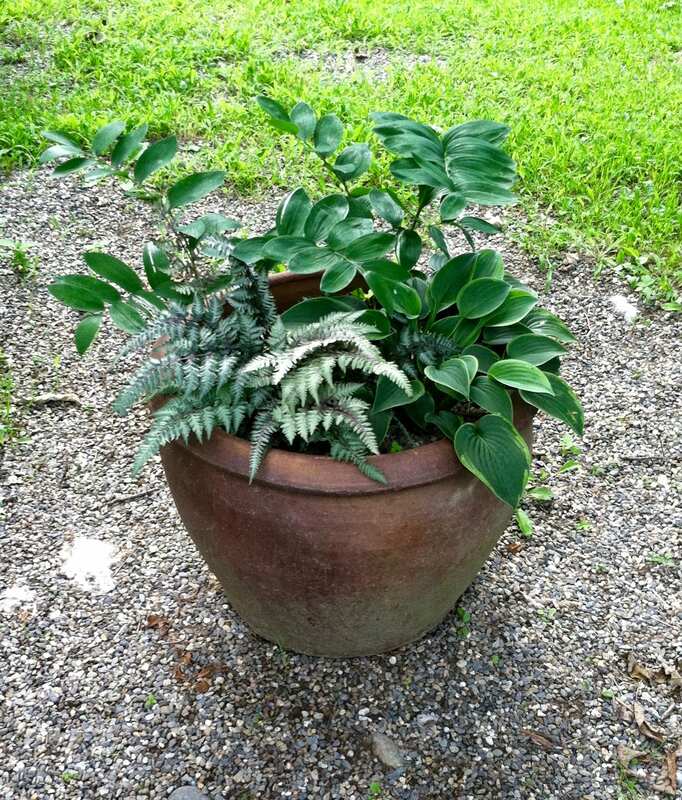 By growing one plant in a pot you eliminate concerns about competition for space above and within the pot. 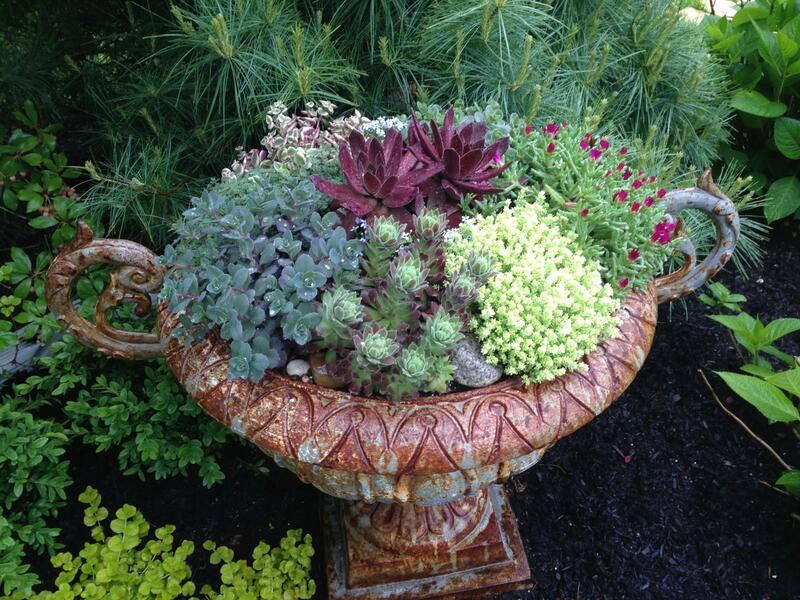 When working with one-plant per container, you can still achieve those three design elements by combining and consolidating your containers to produce a “garden effect.” This will provide a more diverse textural, colorful, and enriching design. Let’s talk plants. Many of the plants that grow in our northeastern rocky or sandy soils with a thin detritus, humus layer in our native ranges are also the plants that can grow well in container gardens (aka, planters), particularly alpine plants such as, arctostaphylos (bearberry ‘uva-ursi’) or empetrum nigrum (black crowberry) or aquilegia canadensis (Canada columbine). With the exception of a few leafy, tender stems, much of what is drought tolerant is also a woody plant or one that grows slowly to preserve its transpiration energy. Choose plants with similar sun and water requirements. If you’re mixing your plants into one container, then you, as the designer and horticulturalist, need to learn which plant goes well with another. The companionship of the plants you select will be a major factor in the success of the container garden’s long-term performance. For instance, pick plants that have varying habits to complement each plant’s features, such as vertical, mounding, and then trailing. Another aspect to consider is the seasonal sequence of a plant’s flowering or foliar interest. It’s sometimes challenging, but in the end it’s worth it to have color interest represented in the container all growing season, whether it’s due to foliage or flower productivity. When choosing herbaceous plants for texture and foliar color, you’ll find that Panicum virgatum (switch grass), sedum acre (moss sedum), sisyrinchium montanum (blue eyes grass), and even Dryopteris felix-mas (male fern) and Polystichum acrostichoides (Christmas Fern) do quite well in container gardens. When you want to add floral appeal, consider that the longest bloom term is usually no more than three weeks, with the exception of echinacea purpurea, (coneflower), asclepias tuberosa (butterfly weed), aster ericoides (heath aster), coreopsis lanceolata (tickseed), and penstemon digitalis (beardtongue). The latter is also wonderful for its foliar interest when it’s not blooming. There are always cultivars of these straight species, so it is up to personal opinion and desire to choose these plants. Utilizing the straight species, however, can increase both plants’ genetic diversity and sources of rich pollen for our pollinators. Using succulents with native woodies provides textural and seasonal interest that can be overwintered in a durable container. When using woody plants, try out Juniperus communis and Juniperus horizontalis. You’ll find the latter is more attractive to touch than the prickly common juniper. The short wispy textures of Erica (heaths), Calluna (heathers), and Comptonia (sweetfern) also do very well. For taller, upright species consider Juniperus virginiana (Eastern red cedar), Pinus rigida (pitch pine) or prunus maritima (beach plum). You can find the evergreens in mini alpine pots or liners; the beach plum can be found in #3 gallon pots and is useful for wind break or for filtering light. Chionanthus virginicus (fringe tree) offers a beautiful fragrant canopy to a tall pot. Hypertufa is a great year-round container that resembles tufa lava rock and blends in well with granite-laden landscapes. Ideally the soil you use for these kinds of container gardens should be sandy loam or the like. Most importantly, peat-moss is not a relevant texture or substrate that these plants will thrive in for drought tolerant conditions. When peat-moss dries out, which is fast, it wicks moisture away rather than absorbing it. The recommended mixture is a medium of minerals, compost, fine aged bark and humus. The more permeable the substrate is in container gardens, the more supplemental water a container will require, even those succulents. With the drought-tolerant mixture, you can get away with watering once a week, or two times at most before the plants start anchoring their roots. As mentioned above, the container you choose can also determine the drought tolerance of the plants. The more porous and the smaller the container, the more you need to be concerned about watering the plants. Containers that are highly porous will require more moisture retentive soil mediums. Also, as soon as plants in a container begin to get root bound, be prepared to water more frequently; therefore, select a pot size that supports long-term growth. With that said, when you plant many ground covers such as those is the Ericaceae family, you’ll want to use shallow, but long planters that effectively encourage the plants’ lateral stoloniferous habit. Similarly, when you are dealing with a mix of plant heights, allow for wide container openings and subtle tapered, if not equally wide, bottoms. Shallow trough planters with decorative, locally sourced accent rocks among alpine and rock garden plants make for beautiful drought tolerant container gardens. 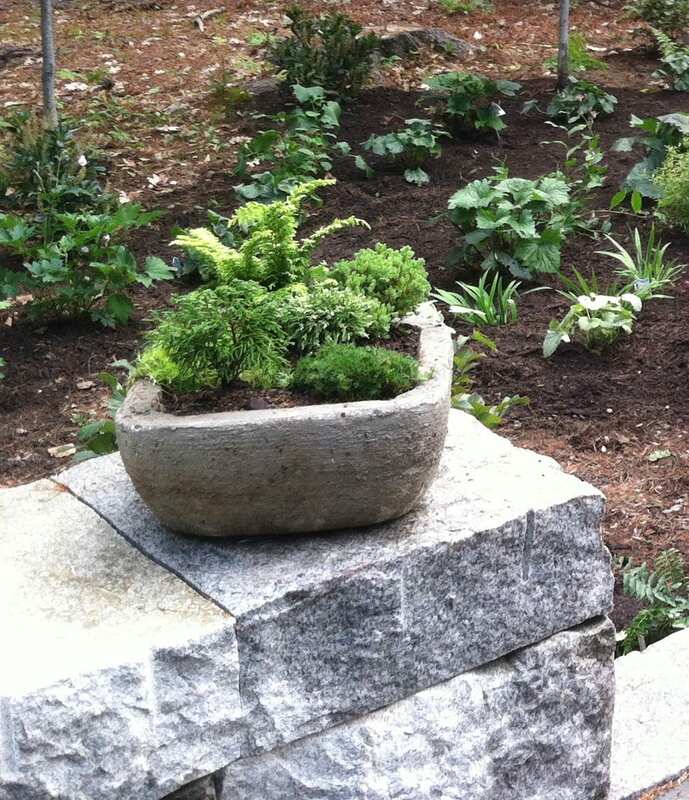 This kind of container garden serves as a focal feature in a small yard or an intimate garden space. Trough planters can also be designed to represent a landscape in miniature on a deck or confined patio space. Antique or contemporary urns or fired concrete containers with wide openings are effective for year-round use and dimensional plant displays. The material a container is made from helps to determine the year-round durability, too. If you want a container that is left outside, don’t forget to either turn it upside onto a pallet or a few 4” x 4” pieces of lumber. If you keep the planter upright, cover the opening (unless it has a concave opening with a flared rim) to allow water/ice expansion. The resin containers left out year-round perform better than basic plasti-cotta, but they are still less durable than casted concrete or thick fired ceramic. Terracotta should never be left out unless covered and raised. So, the next time you create a drought tolerant container garden consider these criteria and plant options. There are so many plants aside from the traditional succulents and annuals that are pushed on us by the greenhouse industry. And don’t forget to use the dolly or the wheeled saucers to enable shifting and arranging the container gardens around for some change of perspective. Irene Brady Barber is Horticulture Educator and Horticultural Therapist, HTR at Coastal Maine Botanical Gardens. With an academic background in Horticulture Science and Communications, Irene loves to learn more from other horticulture professionals about their experiences, tips and educational interests. As an educational program coordinator, Irene is helping to develop CMBG’s Center for Professional Horticulture, therefore she will be pleased to hear from professionals in the Green Industry about topics they want to learn more about. Please feel free to contact Irene Barber at ibarber@mainegardens.org to find out more about what’s happening at Coastal Maine Botanical Gardens or to inform her of topics that are important to you.